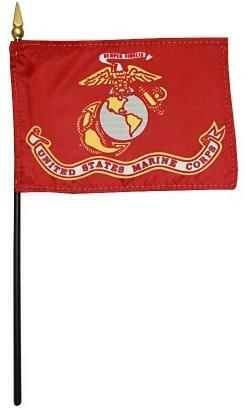 High quality US Marine rayon flag mounted to a 10" black dowel. All our US Marine Flags are proudly made in the USA. In full parade form, this flag is visually stunning. It is a scarlet flag with the Corps Emblem in gray and gold, and bordered by a gold fringe. Battle streamers (long strips that commemorate achievements in military encounters) adorn the top, and the flag must be carried by the Color Sergeant, a man stipulated to be at least 6 foot 4 inches tall (he also serves as the bearer of the Flag of the President of the United States at state dinners). The Corps emblem bears an eagle on a globe before an anchor, and the Latin Inscription "Semper Fidelis"--Always Faithful.